Bengbenro is a leading source for entertaining live TV news. Watch latest top videos on Bengbenro. 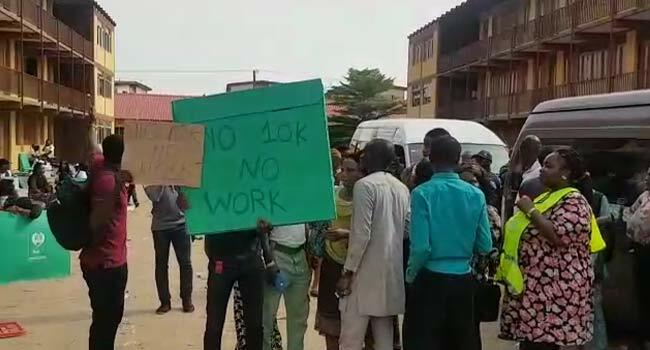 Man, whose name is yet to be ascertained, was captured in a short video clip, furiously demanding to have back his alleged twenty thousand naira, (20k) which he reportedly gave to his purported ex-girl friend Jane for her school fees. From the video, the girl did not deny collecting the money from the man, but was heard when she agreed to pay back the next day. However, the man who stormed her school to create a scene, forgot he was in a citadel of learning, where utmost serenity is needed. He was spotted slapping, pushing and voicing out his anger in the midst of students presence at the scene. 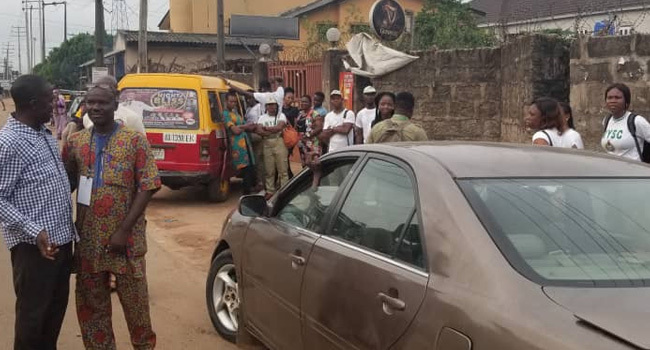 From the video also, a student was heard asking the girl her reasons for collecting the money from the man and till go ahead to break-up with him. Efforts made by some students to hold back the man from beating the girl was futile, as the man had more supporters than those who are for the girl. 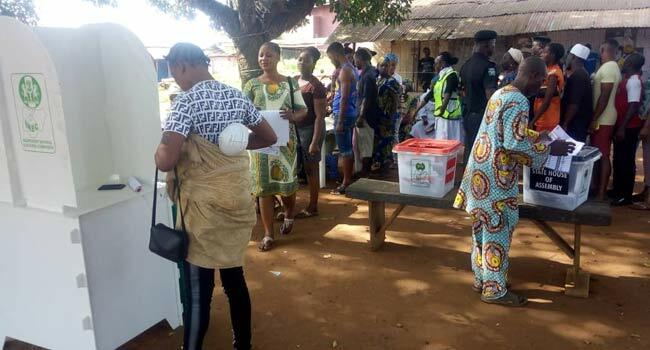 Nigerians are heading to the polls today to elect new leaders at the state level in the governorship and state house of assembly elections. The exercise is taking place in 29 out of the 36 states of the Federation. 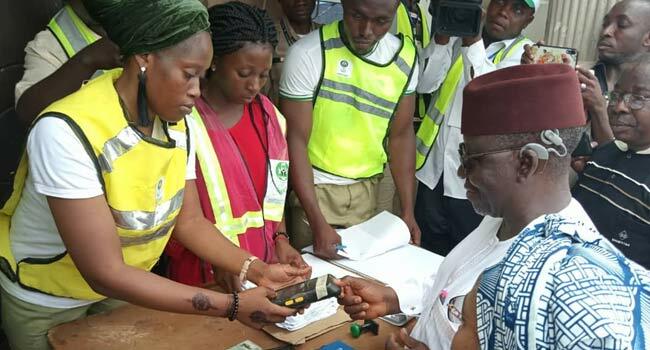 1:17 pm: Governor Tanko Al-Makura and his wives cast their votes at Lungun Wambai polling unit in Lafia, the Nasarawa State capital. 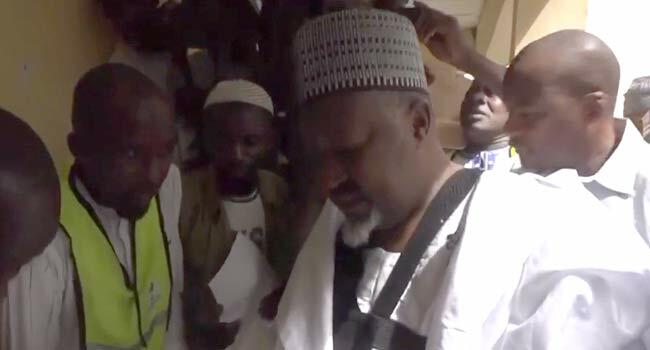 1:10 pm: Governor Badaru Abubakar cast his vote at Arewa ward polling unit in Jigawa State where there was a low turnout of voters. 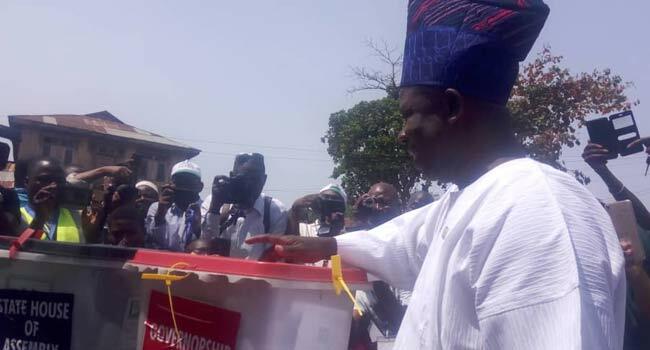 1:02 pm: Governor Ibikunle Amosun casts his vote at one of the polling units in Ogun State. 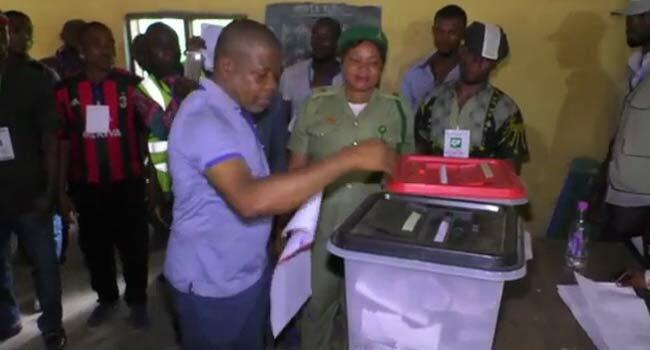 12:45 pm: A governorship candidate in Imo State, Emeka Ihedioha, casts his vote at Mbutu ward in Aboh Mbaise LGA. 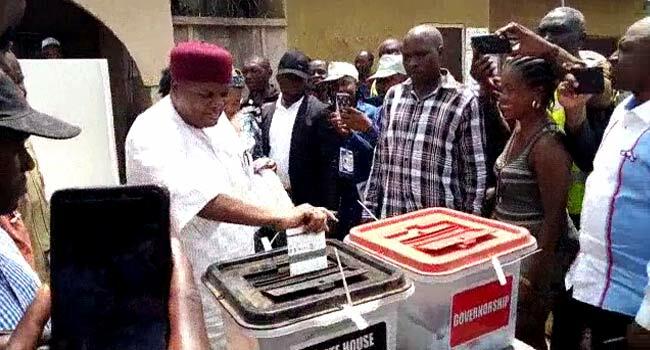 12:17 pm: Taraba State Governor, Darius Ishaku, and his wife, Anna, Ishaku, have cast their ballots at polling unit 004 Kofan Sarkin Jukun Sabo, Gawetum ward in Takum LGA. 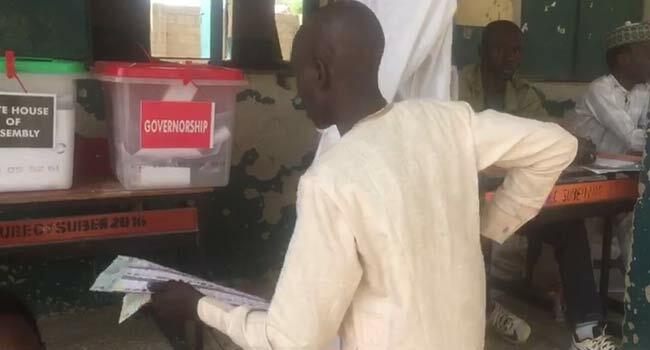 12:12 pm: A governorship candidate in Bauchi State, Bala Muhammed, casts his vote at Yelwan Duguri Central Primary School in Alkaleri LGA. 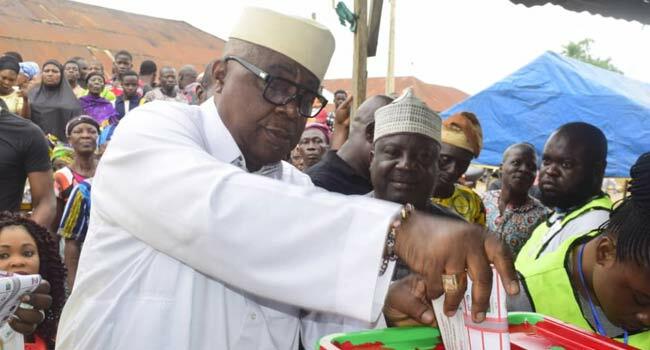 12:03 pm: Former Oyo State Governor, Adebayo Alao-Akala, casts his vote with members of his family at Ward 10 Unit 13, Taara In Ogbomosho. 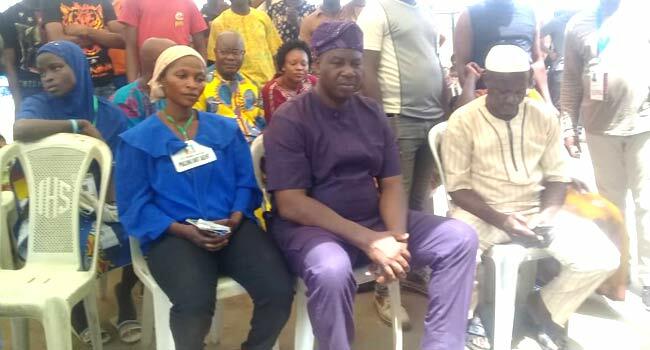 11:54 am: A governorship candidate in Lagos, Babatunde Gbadamosi, casts his vote at one of the polling units in Ikorodu. 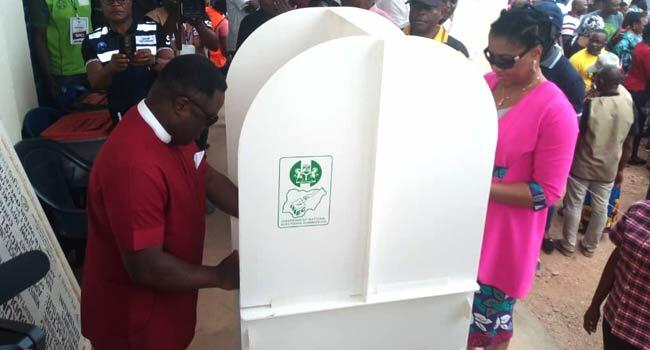 11:49 am: Governor Ben Ayade and his wife cast their votes at Ipong polling unit, Kakum ward in Cross River State. 11: 46 am: A governorship candidate in Nasarawa State, Abdullahi Sule, casts his vote at 001 Motor Park polling unit in his hometown in Gudi. 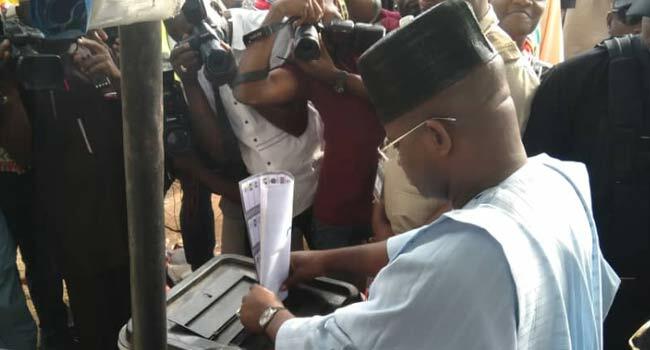 11:37 am: A governorship candidate, Nsima Ekere, and wife cast their votes at unit 004, Edemeya Ward 1 in Ikot Abasi LGA of Akwa Ibom State. 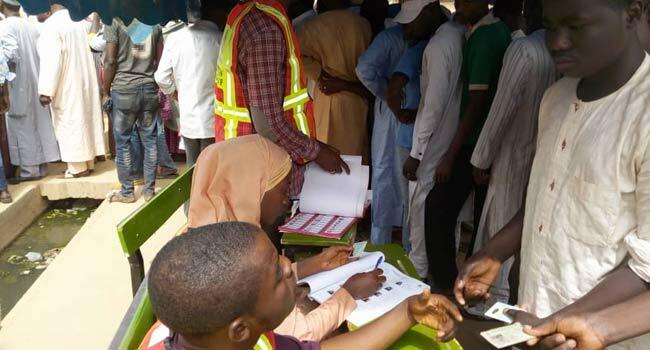 11:30 am: Voting commenced early at 012 Yalwa, Garkar Malam Isa Polling unit Galadima Ward in Mafara LGA, the home town of Zamfara State Governor, Abdul’Aziz Yari. 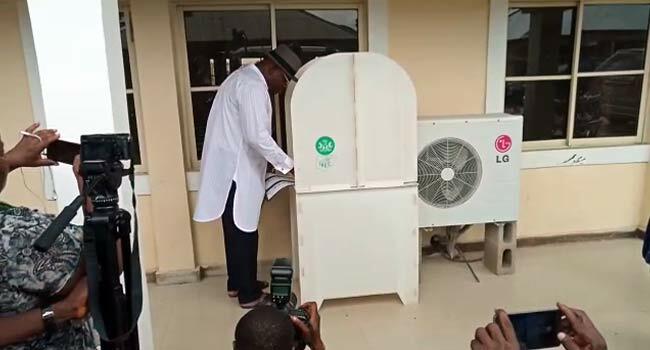 11:21 am: Bayelsa State Governor, Seriake Dickson, casts his vote at his polling unit at ward 2 unit 5, Toru Orua in Sagbama LGA. 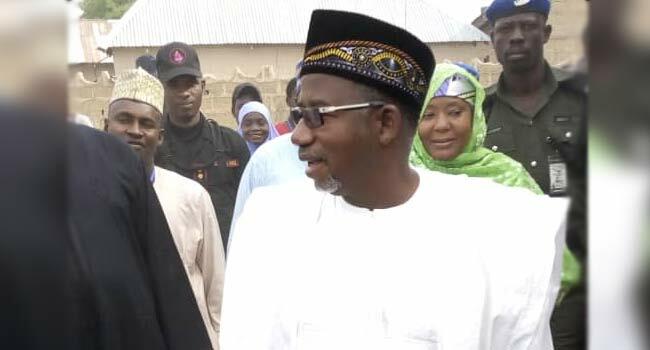 11:11 am: Governor Mohammed Abubakar and his wives cast their votes at their polling unit in Bauchi State. 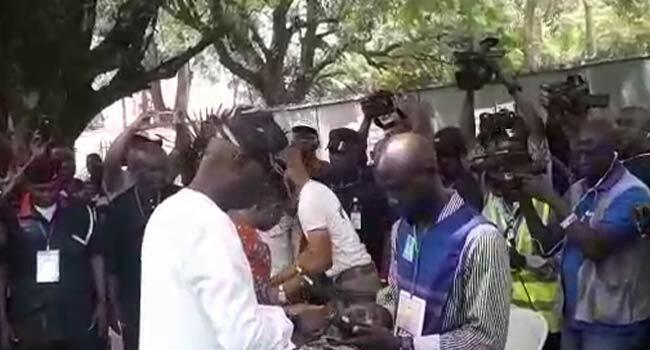 10:58 am: A governorship candidate in Lagos, Babajide Sanwo-Olu, casts his vote at his polling unit. 10:50 am: A governorship candidate in Oyo State, Seyi Makinde, casts his ballot in company with his wife, Omini, at Ward 011 Unit 001 Abayomi, Iwo Road in Ibadan North East LGA. 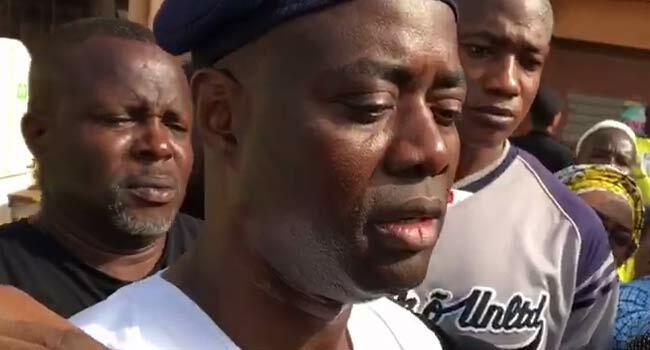 He commended the exercise but said there are reports of ballot box snatching in some parts of the state. 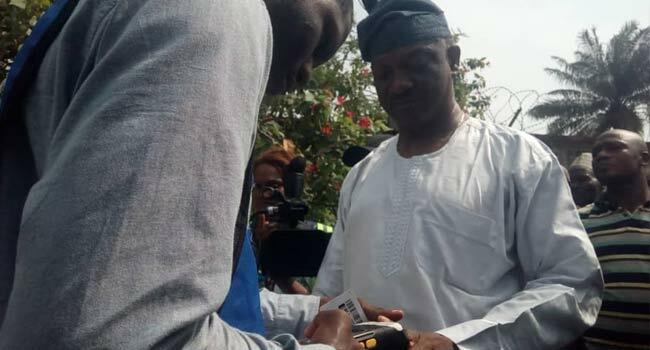 10:42 am: A governorship candidate in Lagos, Jimi Agbaje, casts his vote at ward 004 Takoradi road, Apapa. 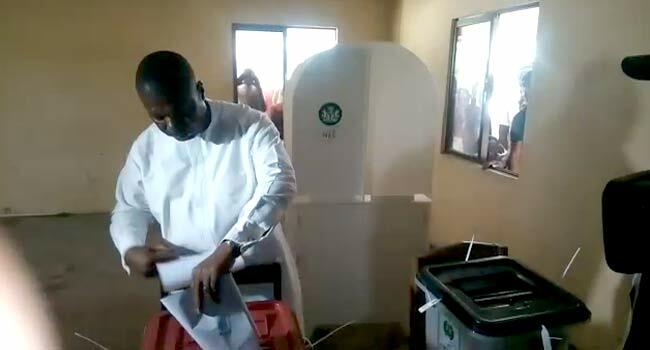 10:35 am: Governor Abubakar Bello has cast his vote in his hometown, Kontagora in Niger State. He urged the security personnel to be at alert, although the exercise in Kontagora is experiencing a low turnout. 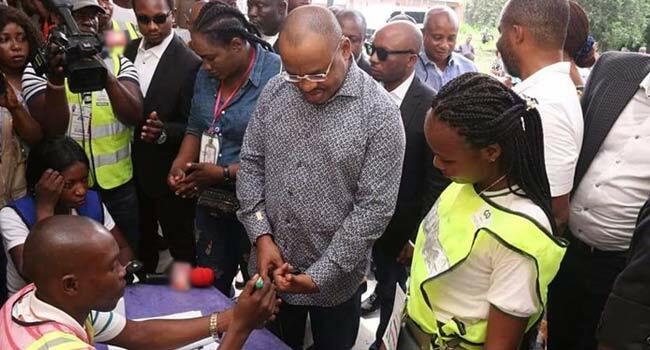 10:30 am: Governor Udom Emmanuel and his wife, Martha, cast their vote at one of the polling units in Akwa Ibom State. 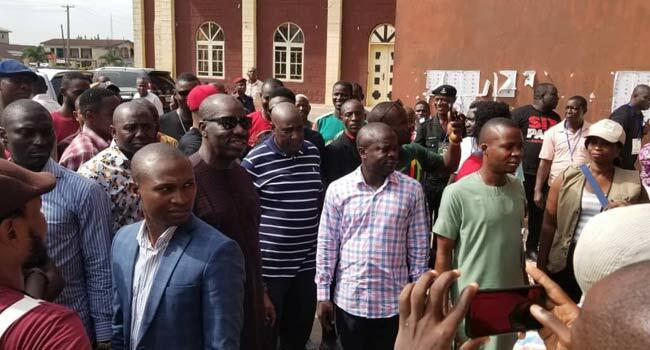 10:22 am: Edo State Governor, Godwin Obaseki, arrives at ward 4 Oredo to cast his vote. 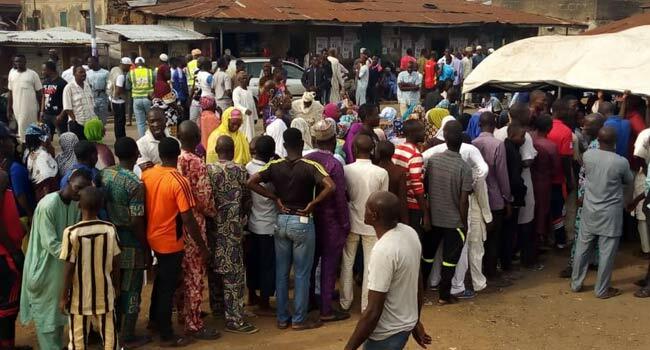 10:18 am: Massive turnout of voters at Ward 3 polling unit 1 in Iregun, Iperu where a governorship candidate in Ogun State, Mr Dapo Abiodun, is expected to cast his vote. 10:12 am: Voting ongoing at Arewa ward in Babura LGA of Jigawa State. However, there is a low turnout of voters. 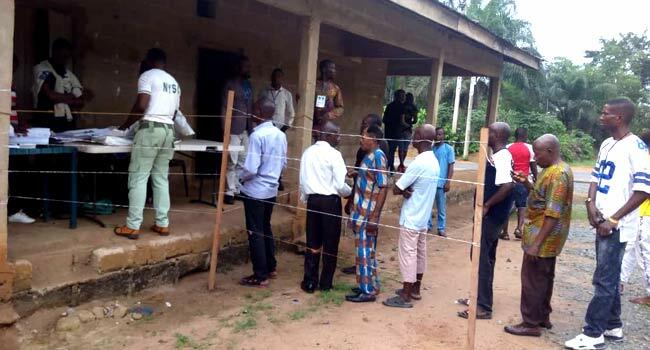 10:06 am: Voters at polling units at Mile 2 estate in Amuwo Odofin LGA of Lagos have been left stranded. 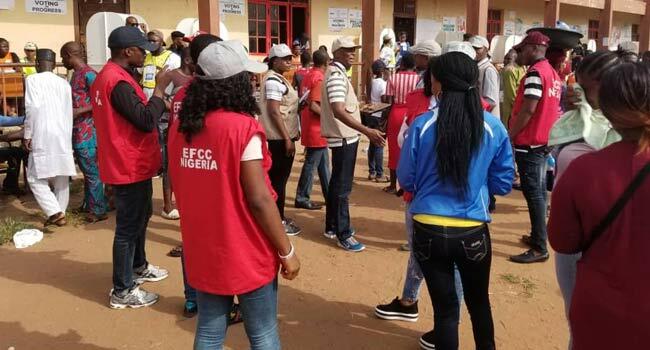 INEC’s ad-hoc staff in the area told Channels TV that they would not conduct the election until they receive their unpaid wages. 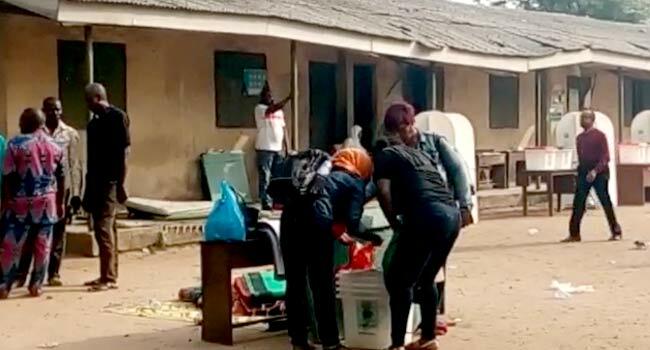 10:01 am: INEC officials arrived late with voting materials at about 9:15 am at Unit 17 Ahiafor/Umuru Ward 5 in Isiala Ngwa South LGA of Abia State. 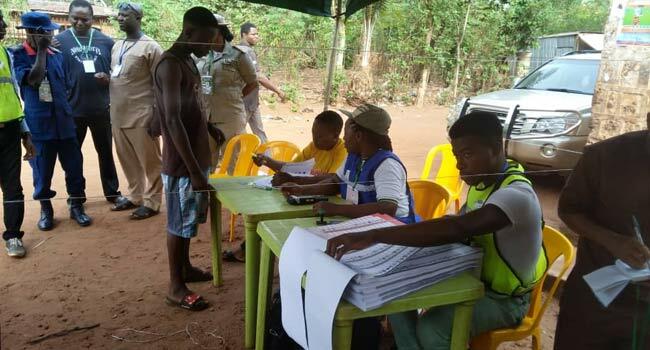 This is where a governorship candidate, Dr Alex Otti, is expected to cast his vote. 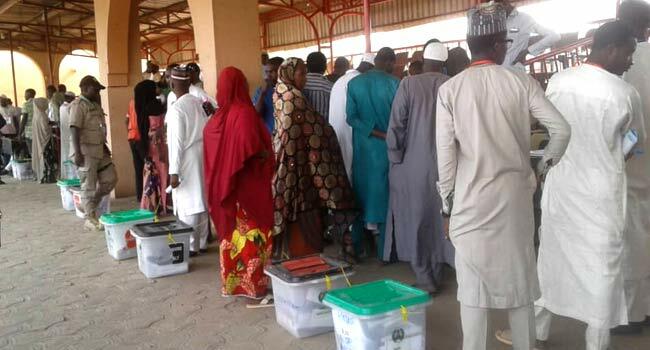 9:48 am: Accreditation and voting commenced early at Muzilci ward in Kano Municipal LGA. The exercise has been peaceful so far as the electorate wait on the queue to get accredited and cast their votes. 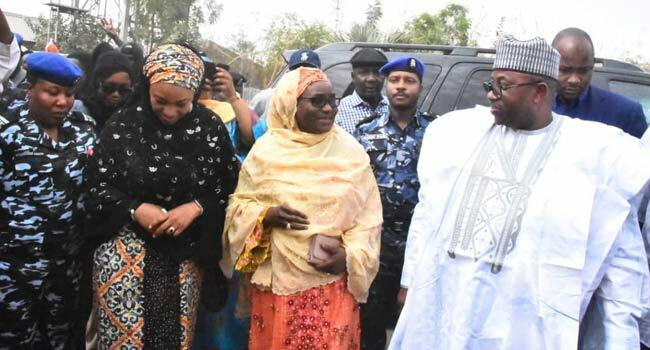 Meanwhile, President Muhammadu Buhari and his wife, Aisha, have cast their votes at Kofar Baru 003 polling unit, Sarkin Yara Ward 3 in Daura, Katsina State. READ MORE. A primary school containing all electoral materials for Mbalom ward in Gwer East Local Government Area of Benue State has been set ablaze. READ MORE. 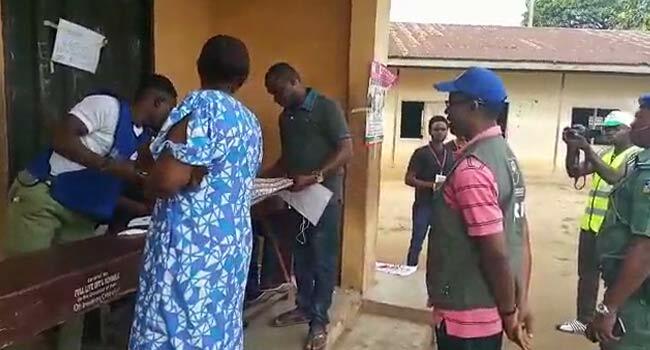 9:40 am: EFCC officials monitoring vote-buying at various voting centres in Edo State. 9:35 am: Accreditation and voting ongoing in virtually all the polling units in Kaduna State capital and other neighbouring LGAs, such as Chikun, Igabi, Kaduna North, and Kaduna South. 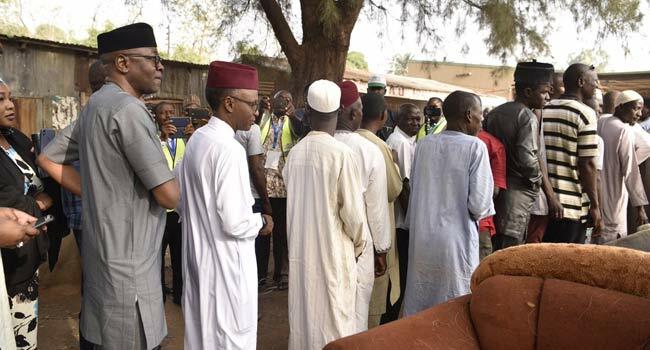 The State Governor, Nasir El-Rufai, joins the queue to cast his vote at Ungwar Sariki polling unit in Kaduna North LGA. 9:30 am: Voting in progress in Gwadawa ward in Jimeta, Yola. The exercise has been going on smoothly so far in Adamawa State. 9:25 am: Voting has commenced in most of the polling units across Ilorin, the Kwara State capital. INEC officials arrived as early as 6:30 am in most of the units while voters were already on the ground. 9:14 am: Voting ongoing at a polling unit in Abeokuta, the Ogun State capital. 9:12 am: Governor Yahaya Bello casts his vote at Agasa in Okene Local Government Area of Kogi State. 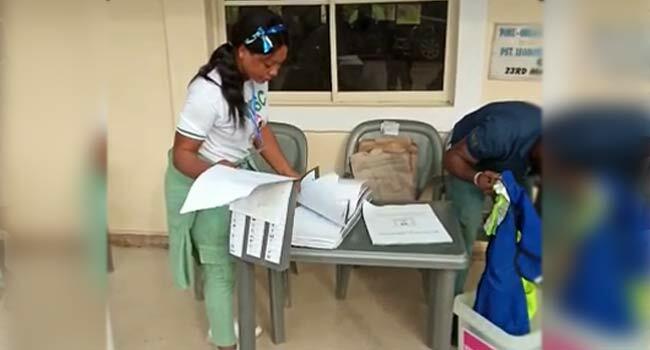 9:08 am: INEC officials sorting electoral materials at a polling unit in Anifowoshe Primary School, in Ikeja area of Lagos. 9:02 am: Voting commenced as early as 8 am at most polling units in Uyo, the Akwa Ibom State capital. 8:52 am: Major logistics and deployment problems at Anglican School, Ogudu in Kosofe Local Government Area of Lagos State. Materials and personnel have yet to be deployed. 8:46 am: Voting commenced as early as 8 am at Amube ward 1 in Orba Udenu Local Government Area of Enugu State. This is the polling unit where Governor Ifeanyi Ugwuanyi is expected to cast his vote. 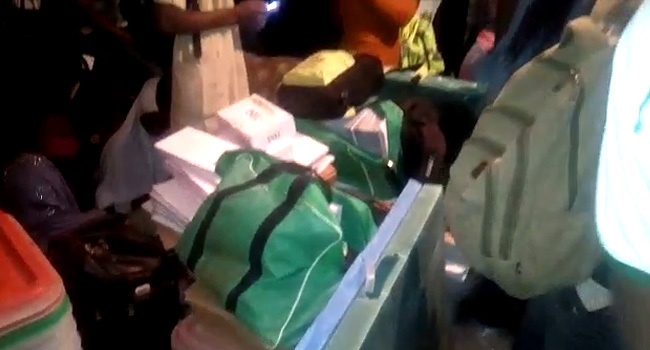 8:35 am: INEC officials have arrived with election materials at Ndume Ohokobe ward in Abia State. Although this is an improvement compared to the last elections where voting was shifted to the next day, voting is yet to commence. 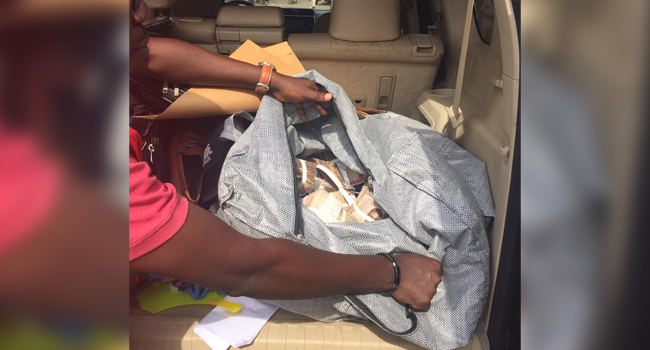 8:24 am: Election materials arrive at ward 2 unit 5 in Sagbama LGA of Bayelsa State. 8:15 am: Accreditation and voting ongoing at unit 11, ward 10, Okesa in Ado, the Ekiti State capital. 8:10 am: Voting set to commence at ward 4 in Oredo LGA in Benin City. 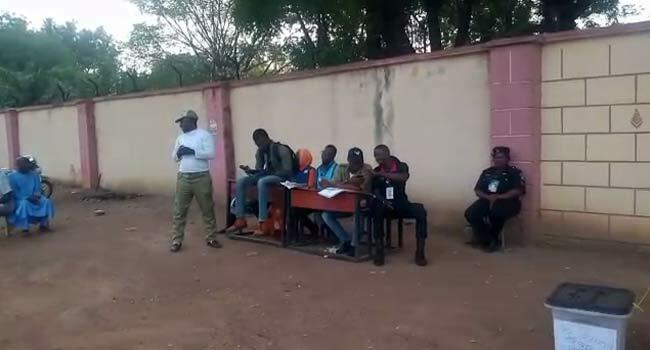 8:02 am: INEC officials already at one of the polling units at Queen Amina Gate in Kaduna South Local Government Area. 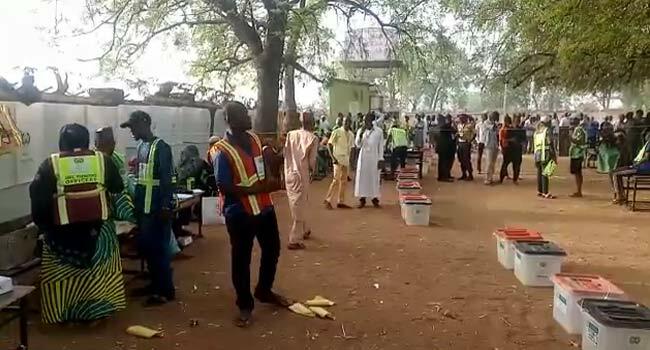 7:58 am: All is set for voting to commence at Capital School in Yola, the Adamawa State capital where there are six polling units. 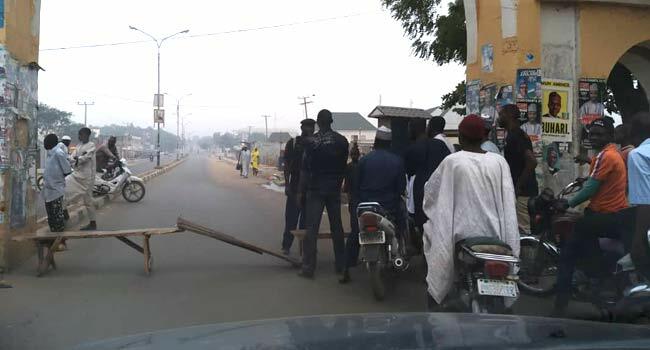 7:51 am: Security operatives enforce movement restriction in Bauchi State. 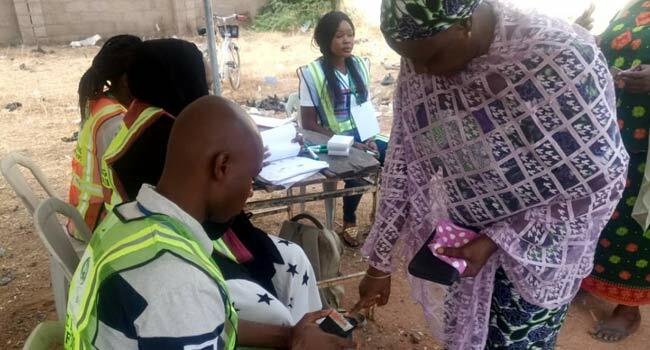 However, those on essential duties and electorate who are voting elsewhere other than the areas they live, and are able to present their voter cards as proof, are allowed access. 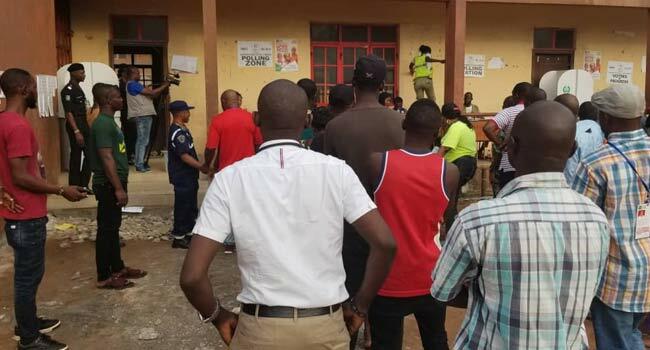 7:40 am: INEC officials and voters are stranded and waiting for the voting centre to be opened at ward 2 in Oredo Local Government Area (LGA) in Benin City, Edo State. 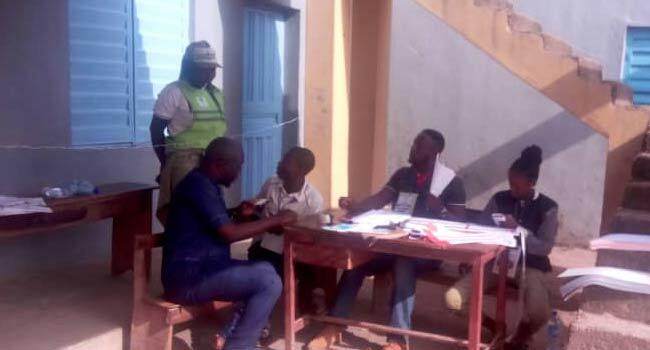 7:34 am: At Kofan Sarkin Jukun, Sabo Polling unit 004, the electoral officers are getting set for the election to commence as all materials both sensitive and non-sensitive are on the ground. 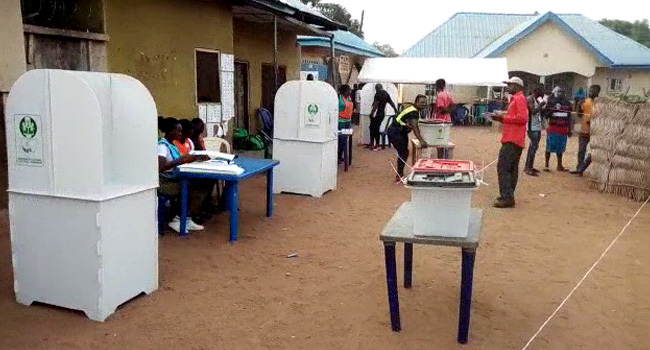 This is where Taraba State Governor, Darius Ishaku, is expected to cast his vote. 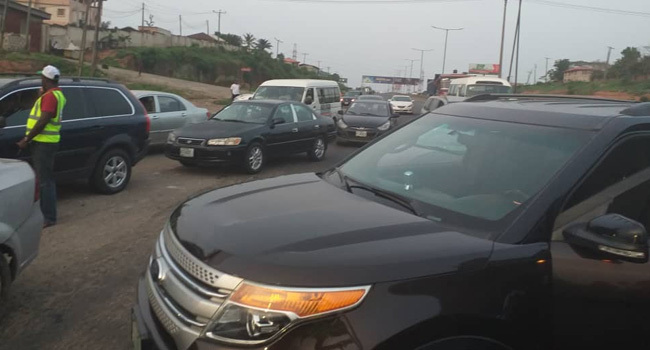 6:05 am: Roadblock at the Otedola Bridge along the Lagos-Ibadan expressway. Security operatives are enforcing movement restriction to ensure that only those on special duties can move freely. 5:17 am: Collection and distribution of materials from the Registration Area Centre for Naraguta B at Government College, Zaria Road in Plateau State, commenced as early as 5:00 am. The founder and General Overseer of Omega Fire Ministry International, Apostle Johnson Suleman, has reacted to Alhaji Atiku Abubakar’s loss to President Muhammadu Buhari in the Feb. 23 presidential election. The cleric advised the Peoples Democratic Party, PDP, presidential candidate to shun the idea of approaching the court to seek redress. In a viral video from his Church Service on Sunday, Suleman admonished politicians to let peace reign in the country. President Muhammadu Buhari on Wednesday received certificate of return as President-elect at an occasion he used to thank Nigerians and sue for peace in the country. At the International Conference Centre, where the certificate was presented to him, Buhari assured the nation that he would continue to engage all parties that have the best interest of Nigerians at heart. He noted that “election should not be seen as do or die’’ and pledged to work hard to deliver a better Nigeria and to continue to build on the foundations of peace, rule of law and opportunities for all. 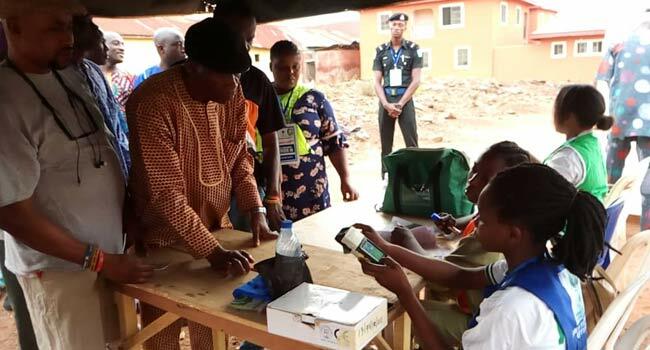 According to the Collation Officer, Buhari polled 1,232,133 votes to defeat his PDP opponent, Atiku Abubakar, who scored 308,056 votes. 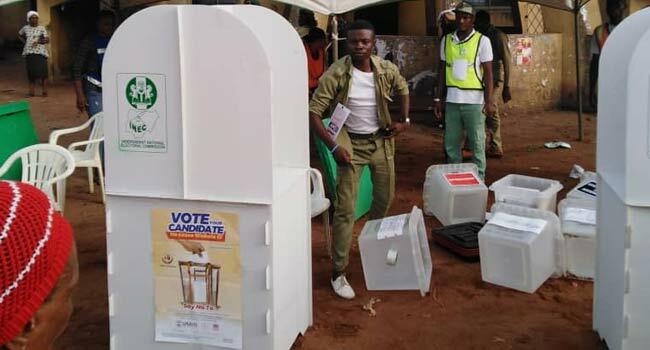 The Independent National Electoral Commission (INEC) Collation Officer for Kaduna State says President Muhamadu Buhari of the All Progressives Congress (APC) has polled 993,445 votes to defeat Peoples Democratic Party (PDP)’s Atiku Abubakar, who scored 649,612 votes in Saturday’s presidential election in the State. 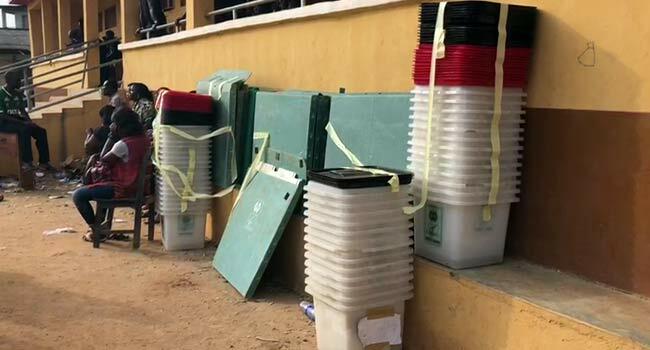 The result was announced at the National Collation Centre (ICC) Abuja, by the INEC Collation Officer in the state, Prof. Bello Shehu, Vice Chancellor, Usmanu Danfodiyo University, Sokoto. 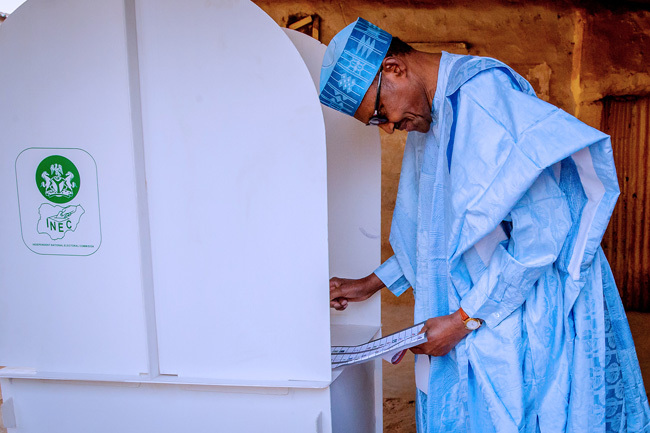 Results announced by the Independent National Electoral Commission (INEC), so far, have placed President Muhammadu Buhari‘s All Progressives Congress (APC) in the lead of the 2019 Presidential and National Assembly elections. 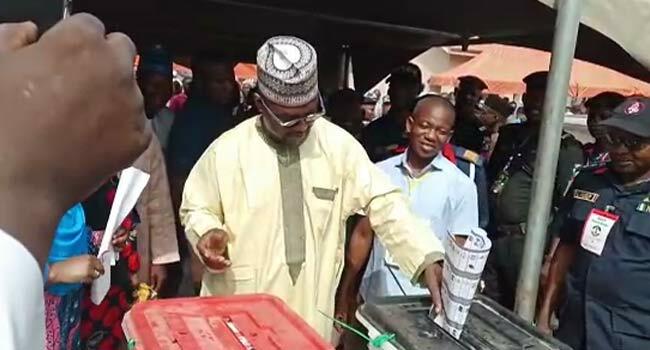 The Returning Officers for Kwara and Nasarawa States announced the results of the elections, held on February 23 nationwide, for their respective States. 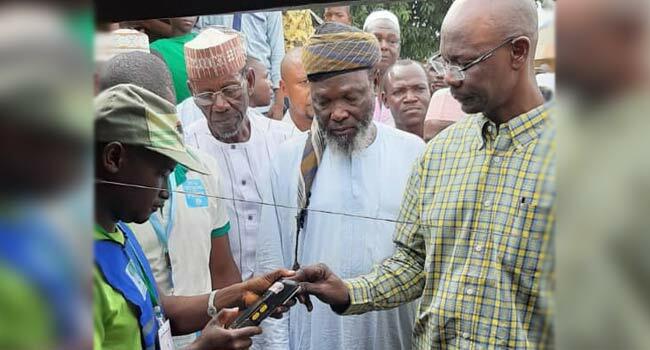 The margin of victory for President Muhammadu Buhari‘s All Progressives Congress (APC) has widened as the party wins in Kogi and Gombe States according to results announced by the Independent National Electoral Commission (INEC). Head of the Commonwealth Observer Group, Dr Jakaya Kikwete has called for the prosecution of anyone responsible for election-related violence in Saturday’s presidential and National Assembly elections. In the group’s Interim Statement presented in Abuja, Kikwete, who is a former President of Tanzania, said that those responsible should be held accountable.